A Rake is a Rake…Or Is It ? Which tools work best for each operation? Below is a chart that looks at the various tasks and ranks how each of the tool’s performances typically pan out. Keep in mind that ultimately the choice of tools for a task usually falls on the personal preference of the groundskeeper performing the task. Everyone has their favorites but the chart should give you a place to start if you are looking for the right tool for the job. Your basic standard issue ground crew rake. Nothing special here, but it can do most basic jobs fairly well and usually comes in several different widths, from 24” to as wide as 60”, depending on the tooth style chosen. These rakes tend to be the workhorse of a ground crew. They can take the real “bull” work of rough grading and general raking better than any other rakes. The short tooth rake leaves a fine grade, good for finish work after trash (pebbles, dead grass clippings, clay chunks, etc.) has been removed on skin areas. The sharper teeth are suitable for shallow scarifying. Will struggle if used for general raking or rough grading. You really need the longer teeth for that operation. The best of both worlds! Short and long teeth on one rake makes this rake more versatile. It can be used in many different applications. This rake is not for everyone though. Some people prefer to have the straight edge on one side of the rake instead of teeth on both sides. A great all-around rake, a wooden grading rake is not as bulky and awkward as an aluminum grading rake. This lightweight rake truly excels with finesse work where detailed finish grading is desired. I’ve found that groundskeepers either really love this rake or they hate it. It all comes down to personal preference. The teeth are easily replaced if broken. Unfortunately the main manufacturer in the U.S. recently moved their plant and the over 100 year old machine that creates these rakes is proving very testy as they attempt to get it up and running. We hope it returns soon. If you are dealing with pebbles and rocks on your infield skin, this rake can be your best friend. The screening rake, combined with a steel mat drag and a sifter scoop shovel will help to greatly reduce the population of pebbles and stones in the infield skin over time. This rake will also do an adequate job in rough grading and removing other trash from the soil as it is graded. There are several things to look for in order to have the right iron rake that can be productive for you. 1) Use a “level head” rake (T-shaped head as pictured to the left). Avoid a “bow rake” as these tend to vibrate or jump when pulled on hardened soil. 2) Make sure it has curved teeth. The curve places the teeth at a better angle for cutting into soil. 3) Sharpen the tines on the back. Grind the bottom ¼ of the tine of the rake on the back side down to a sharp point as illustrated to the left. A sharpened rake reduces the amount of effort the operator must apply in order for the rake to cut into the soil. This is especially true when shaving down high spots in mound and home plate clay areas and shaving out the small hardened lips along the turf edges of the infield skin. Used mainly for removing loose infield soil and topdressing out of turf edges before rain or irrigation glues it in tightly. There are lots of different lute scarifying rakes available on the market, but the key to this lute rake is the curve in the rake head. That simple improvement over the other flat lute heads improves its ability to pull larger amounts of soil on the flat edge side without excessive operator fatigue. The curve also improves the performance of this tool for back raking wet infield skins on the serrated edge, especially those using infield topdressing. The level board is the best fine hand grading and leveling tool available for groundskeepers. The stainless steel reinforced edge insures a strong cutting edge while the relief angle on the back of the level board head allows the tool to float on the surface more easily than the back of any metal rake. The 54” wide head improves grading and leveling on large areas. You should pperate it in much the same manner as a road grader operates its blade. This blog provides a general direction as to the grooming tools to use for the tasks listed but every groundskeeper has an opinion or favorite tool. Lets get some feedback from our readers/groundskeepers out there. Tell us your preferred grooming rakes for various tasks or whether you agree with our ranking of the tools. Wear and Tear of the Groundskeeping Staff ! Football season is underway at all levels across America. Teams have begun to prepare themselves for the long season ahead. As a result, this is also the time of year when recreational baseball/softball fields may also be forced into double duty posing as football fields – which used to be standard practice for Major League Baseball and NFL Football. Today, heightened expectations for what a field “should” look like, along with heavily scheduled fields across multiple sports, can take its toll on the groundskeeping staff. Dual Purpose Stadiums . . . . . When I was a kid/young adult back in the 60’s, 70’s and 80’s, dual purpose stadiums were the norm in professional sports. These fields would get torn up as they switched back-and-forth between football and baseball. It was one of the reasons for the birth of the artificial turf industry back in the mid-60’s. In those days, it was acceptable to have some wear (in some cases a lot of wear) on those professional fields during the overlap of sports seasons in August, September and October. Groundskeepers didn’t like it, but they did their best to minimize the extent of damage and everyone understood for the most part. The Ballpark Building Frenzy Changed Expectations . . . . .
Once we hit the mid-80’s and continuing through the turn of the century, there was a stadium/ballpark building frenzy as many cities erected new ballparks and football stadiums. These new athletic facilities were always single sport facilities. Not only were football and baseball finally separated from each other, but the new field systems provided included much improved drainage systems, irrigation systems and the latest and greatest in turf grass cultivars that were more disease and traffic resistant.Additionally, unlike the last century, every game in every league in both of these sports are now on TV, and not the standard definition TV that we had in the previous century that actually hid a lot of problems on a field. Now we have Hi-Def TV that makes turf damage easier to spot. Because of this, we have moved into a new era of professional sports turf management where professional fields are expected to be perfect every day. And should a field have issues or display damage, there becomes much more heightened speculation and banter by observers, sportscasters and others as to what is wrong with the field. All of this TV coverage adds additional scrutiny on the groundskeeper. It’s as if a sports field manager is not allowed to have a blade of grass out of order at the professional level. Most groundskeepers I know are their own worst critic; to many of them they feel their field is only perfect maybe a couple dozen times a year. I was the exact same way in my years with the Orioles. The Perfection Expectation is Contagious . . . . . Unfortunately, this demand for perfection sometimes translates down to the recreational level. I have talked to many parks and recreation managers through the years who tell me stories of the public using their recreational fields, wondering why their park fields aren’t as good as what they see on TV when watching professional games. There is obviously a serious disconnect here if the public can’t separate public recreational fields from high-maintenance professional fields that they view on TV. This is unfair pressure and criticism bestowed on parks and recreation field managers whose resources are usually a small fraction of what the pros have to work with. The modern sports field manager has pressures coming from all directions – heavily scheduled facilities, tight or reduced budgets, limited resources, weather and just not enough hours in a day are some of them. Expecting perfect or flawless fields is like asking a ballplayer to always bat 1000% or a doctor to never lose a patient. As groundskeepers we will all have wear to deal with, more at times than others. As long as you feel you have done everything in your power and budget to make it safe and playable, that’s what really matters. Blemishes and wear will come and go. If you need help stretching your field maintenance budget, our staff is happy to help you plan and prioritize your ordering. Just give us a call at 800-747-5985. The ultimate ballfield resource. 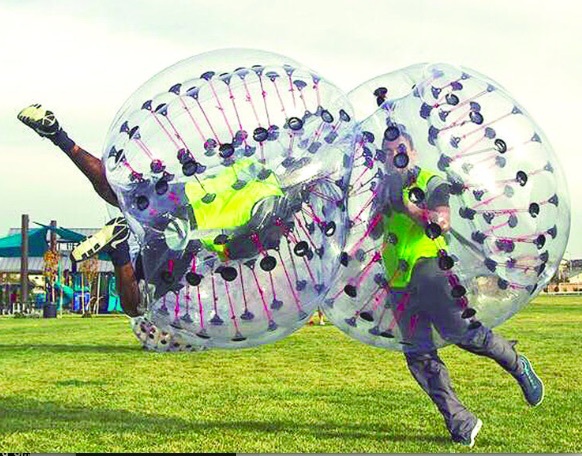 It’s all here. . . . . .
Knockerball set to kick off ! Hammond, LA., locals will soon be able to don large plastic balls at Chappapeela Sports Park and take to the field to play soccer with a crashing and bouncing twist called KnockerSoccer. Barker said they may expand into other sports using the KnockerBalls, but wants to start with soccer, as he said there is always a demand for adult soccer leagues with locals. The teams will play on a smaller soccer field in teams of five. The leagues will be organized by Tangi Kickball, which has a Facebook group under the same name, but played at the park. “I hope people are going to be excited about this and come out and participate,” Barker said. The KnockerSoccer League plays by the same rules as traditional soccer and is co-ed. No positions, coaches or goalies are needed. Rules state players cannot intentionally kick the balls or other players with their shoes or feet and no cleats or pointy shoes are allowed. The cost of a team is $150 for up to eight members. The season starts Sept. 10 and ends Nov. 5. Registration is open now and will close Aug. 31. There will be a Winter season starting in December and a Spring season starting in March. Registration is at Chappapeela Sports Park on Hipark Boulevard. For more information, visit Tangi Knockerball on Facebook. Just Around the Corner ? . . . Fall Renovations ! With autumn sports getting ready to ramp up in the coming weeks and summer baseball/softball season winding down, it’s wise to finalize your fall renovations NOW. It’s always amazing to me how many people in our industry wait till the last minute, scrambling at the eleventh hour to try and pull a project together. Now they may be successful at pulling that off but it surely can’t happen without some stress for the manager and his/ her crew. If your fall renovations involves bringing in contractors, you’ll want to lock them in quickly before they get booked up for the fall. The rule here is the earlier in the year you can confirm the project, the better. Those who notoriously wait until the last minute to try to hire contractors for their field work will likely find themselves getting shut out because most quality field contractors will already be booked for the season. The earlier you lock them in, the better choice of dates you have to select from for them to complete your project. Part of your fall renovations may require some quantitative testing, such as a soil fertility test for grass areas. These tests are used to help determine your fertility needs in order to bring your soil fertility up to optimum levels for your turf grass. This is always a good idea, especially going into fall as the soils have been depleted somewhat from the active summer growing season. The turf plants are in need of nutrients to rebuild their root systems, repair from summer disease and drought damage, and to aide in winter carbohydrate storage as winter dormancy approaches. The other testing you should consider would be your infield soils. Did they perform like you wanted them to? Do they take too long to recover after a rain? Are your infield soils stable or loose? Does your infield soil runoff or move dramatically when it rains? These are all signs that your infield soils may need some help in order to bring them into balance to improve performance. Don’t guess what’s wrong with your infield skin; have it tested. Many can test, but few can analyze and interpret the results properly with respect to infield soil use, so choose your testing agency carefully. Beacon was one of the first companies to provide infield soil testing, analysis and recommendations for improvement back in the late 1990’s. We have over 30 years’ experience on staff to find the right solutions for your infield. Get your testing completed soon so when the season ends, you can jump right on that infield soil renovation project if the testing indicates the need for it. With results and recommendations in hand, you can plan and order the soils needed to blend into your infield to correct for any deficiencies. Choose your projects, order your materials and equipment and begin to strategize how you will schedule the project and your crew. Planning is an important stage of sports field management. Shooting from the hip causes inefficiencies and idle resources. Proper planning builds efficiency and keeps those resources busy, which usually increases the number of projects that can be taken on and completed during your fall renovations. Don’t hold up your crew(s) by not being prepared this upcoming renovation season. Get your testing completed, make your plans and purchase the products needed so that when the time comes, your crews are ready at the gate. They’ll know where they are going, what they are doing, and have the material and equipment to get the job done in a timely manner. Skokie, IL. Park Board narrows in on final plan for new park ! The Skokie, IL. Park Board appears to be getting closer to making a decision on what will be included as part of a planned new park to occupy 17 acres of property. In the spring, a public hearing on development of Skokie Sports Park East included about a half-dozen plans — some with elaborate features, one even calling for a domed facility. But Park Board commissioners last week narrowed their options to two plans, and the final plan to be decided on could be a hybrid of the two. Park District officials say the park will include a configuration of lit fields that can be used for baseball and softball as well as cricket and soccer. The park will have other amenities as well. Under the plans, at least some fields would have synthetic turf, which is more costly but makes them much more usable and manageable after heavy rains, project designers said. Representatives of the Lakota Group and Gewalt Hamilton Associates, Inc., firms that are developing the new park, told the Park Board that synthetic turf fields have become increasingly valuable for recreation facilities like the one Skokie is preparing. They said there is “virtually no maintenance” involved in these fields. One of the two final plans presented to the Park Board Tuesday, July 21, is estimated to cost $14 million, the other $20 million. But park officials will have opportunity to streamline a final plan in various ways, which could greatly alter the cost, the project designers said. Both plans include additional parking from the 148 spaces available there now. The number of spaces at the site would increase to a minimum of 278 and likely more. The park would also include a splash pad, but its size and configuration are still to be determined, as well as a fitness area. The process has included input from a number of different sources including park patrons. Park Board Vice President Susan Aberman said a walking path in or around the park should be viewed as a high priority based on feedback about the proposed park. Commissioners also were hoping a skate park would be part of the new property, but in the end, the designers said it wasn’t a good fit and called it “incongruent” for the kind of park being developed. Park leaders vowed they will continue to explore options for bringing a skating area to Skokie. The Skokie Park Board has had its eyes on the property next to Skokie Sports Park for a long time. The site was once occupied by a gas manufacturing plant, which produced gas from coal from 1910 to the 1940s. Legal challenges and a settlement led to a major $60 million to $70 million environmental clean-up by Nicor Gas and ComEd that began in late 2012. The process if finally winding down this summer. The Metropolitan Water Reclamation District owns the property, the west half of which is leased to the Park District for the sports park. Once the cleanup is completed, the adjoining section will also be leased to the Park District. Differences in the plans include configurations on how to enter and exit the new park as well as the way fields are laid out and their uses. The designers said there has been a declining desire for fields to accommodate baseball and softball, but the need for soccer, Lacrosse and soccer fields are on the rise. Some commissioners are planning to take a nearby field trip to the Winnetka Park District to see how one of its parks operates before a final decision is made. Park Board Executive Director John Ohrlund said the Park Board could make a final decision in September.